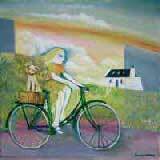 Dorinda Johnson was born in Glasgow in 1945 & studied at the Gasgow school of Art 1962-1966. As a student, boundaries between disciplines were always being pushed aside. In paintings, ceramic & print, new worlds of light & colour inspired her work. 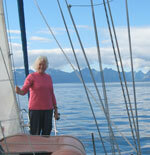 Dorinda has lived on the Isle of Tiree since 1997. Tiree is a land of extremes. Challenges of the forever changing sea, sky & people. Windows of magical light which transform lives are the poetry of the paintings. Since 1970 Dorinda has exhibited & created new works from studios in Dunbar, Findhorn, Edinburgh & Port Appin & now Tiree. Always living through her art, Dorinda Johnson, (nee Patricia Johnson then Patricia Hassall) absorbs & observes life & hidden worlds. Her life journey is one of adventure in this world, across the oceans & through her art. Her subject the lone traveller through life. Copyright © 2012 Dorinda Johnson.